Located in a development in the Old St/Shoreditch area, a temporary wooden construction has taken on a whole new lease of life, becoming something of an outdoor art gallery. 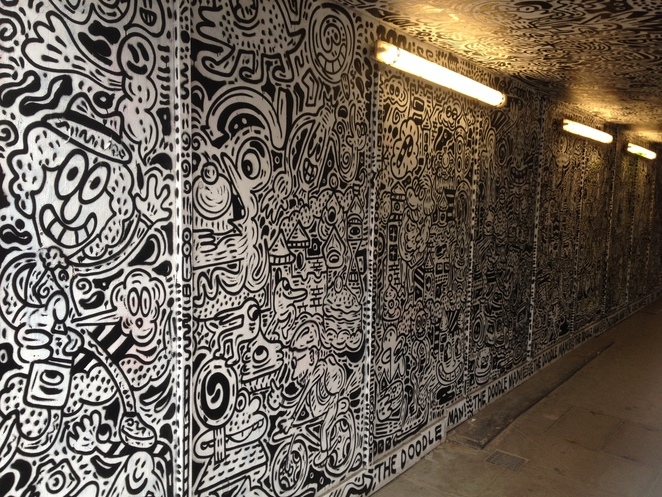 What could be a very basic, almost intimidating structure now offers delight within its small black and white details, the whole of the structure covered in a visual mosaic of graffiti. Rather than big, single images which is the norm of graffiti artists, the style here revolves around small images, but lots of them - linked together in some form of flowing narrative, which can loosely read according to how your eyes pan across the details. It both looks great within the individual details, or when viewed as a whole. The artist responsible for this, the Doodle Man himself, is a recent graduate of art named Sam Cox, and he has worked for a number of clients already, all presented in his inimitable style, which he calls 'Graffiti Spaghetti'. 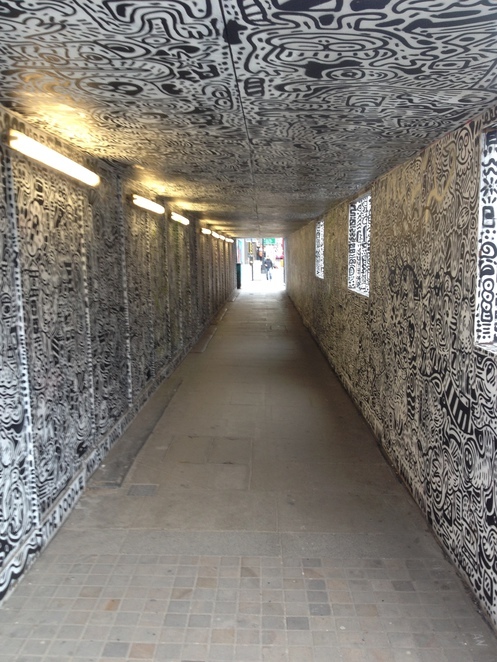 So, if you're passing through the area, take a trip through The Doodle Man Alley, and stop for a moment, as you look more into the spaces and details of the artwork, a story of your own creation will begin to unfold - what it will say is absolutely up to you to decide.